Thomson Park wayside exhibits adhere to the best standards and practices of the National Park Service and other leaders in historical interpretation. For details, see the park service guidelines at http://hfc.nps.gov/products/waysides/index.htm and the NPS Wayside Guide. The goal of the exhibits is to educate and inspire visitors using bold graphics and text. We tried to make them appropriate for typical visitors to the park – the general public, not only scholars and historians. The park includes one upright sign and four exhibit panels that do not obstruct the view of Breach Inlet and the Atlantic Ocean. The wayside exhibits are 36″ x 24″ panels installed at waist height and constructed of self-supporting, UV resistant, fused polycarbonate with a 10-year warranty. Graphics are featured and concise text is presented in an easy-to-read type. The panels shown below are grouped together for easy visitor access and readability. This looks great, Doug! You guys have accomplished so much so far, and in much less time than I would have expected. This will be a great addition to South Carolina’s long chain of historic sites. They will serve nicely to commemorate the site’s historical role(s). Visually stunning. I am so impressed. It was a pleasure to meet you the other day. Great stuff! I need to make a observation. The first panel is excellent in the text listing Fort Sullivan (now Fort Moultrie). However, after that, and in the sidebars and other panels the text reads Fort Moultrie over and over. 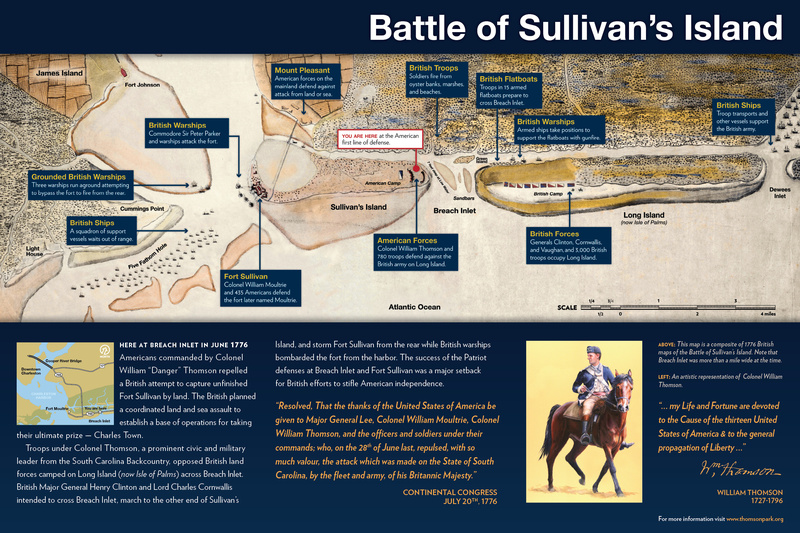 I think the text should read only Fort Sullivan as it creates an impression that the fort was named Moultrie during the battle. In the first panel the text is correct that it reads – Fort Sullivan (now Fort Moultrie) after that; change all text to Fort Sullivan with no reference to Fort Moultrie as the reader understands. Here is another observation. If you notice the text reads Long Island (now Isle of Palms) which is great. However, any following references are alway read as Long Island. You get my drift? Keep all names of places in the context used at time period and do not change it for modern day convience. This is great work. I enjoy this project. Good point – we were not consistent. We changed to call it Fort Sullivan in the final version. Period accounts refer to the fort later named Moultrie several ways: “the fort”, “Fort Sullivan”, “the fort on Sullivan’s Island”, etc. It did not have an official name at the time, but Fort Sullivan was used by several sources. As Dean mentions, the fort was named for Colonel Moultrie shortly after the battle. I would recommend adding African slaves. Just using the word slaves is plain to me. It seems to me that of all recent multiple histories I have read the word African is injected. Not trying to be PC. We changed the term to African slaves in the final version. Thanks, Dean. Doug you have done amazing job with this. Great thanks for preserving the history of my 8th Great Grandfather. Doug, Only a military man could have put the exhibit together with such clarity that a layman can understand it. Also, your computer sophistication is a plus. I learned a lot, and I thank you. Doug: The Wayside Exhibits are very good. 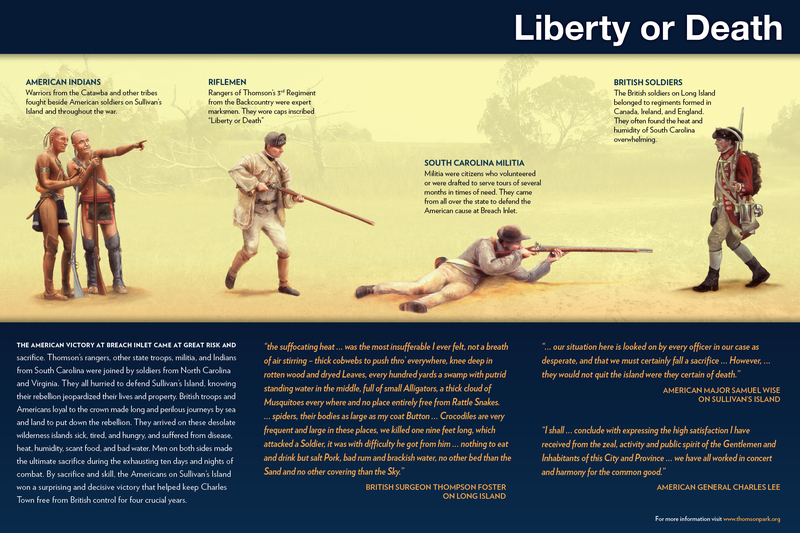 As an South Carolina educator these can be used especially in the eighth grade because we focus on South Carolina’s role in the history of the United States. We have standard 2.2 in high school to focus on South Carolina’s role in the American revolution. Hopefully South Carolina teachers will take advantage of this historical site and website. Looking over the Wayside Exhibits I picked up on the fact there is primary source material which can be utilized in the education of students in South Carolina and the United States. Doug: The Wayside Exhibits are very good and fit the National Park Service exhibits that are at Fort Moultrie today. Hopefully Dean Hunt will help spread the word of this site with the educators in the Lexington school district. I have a friend at Hartsville High I am going to get the word to and hopefully she will spread the word in Darlington County. I am going to send it to my district technology person so hopefully he will send it out to the Marlboro School District. I am going to try and contact Long Middle School and Cheraw High School about this site. I feel they will utilize it. Thanks for spreading the word, Chuck. Students and others in the Pee Dee region will be interested to learn that accounts indicate Cheraw, Peedee and Waccamaw Indians were among those fighting with Colonel Thomson at Breach Inlet. 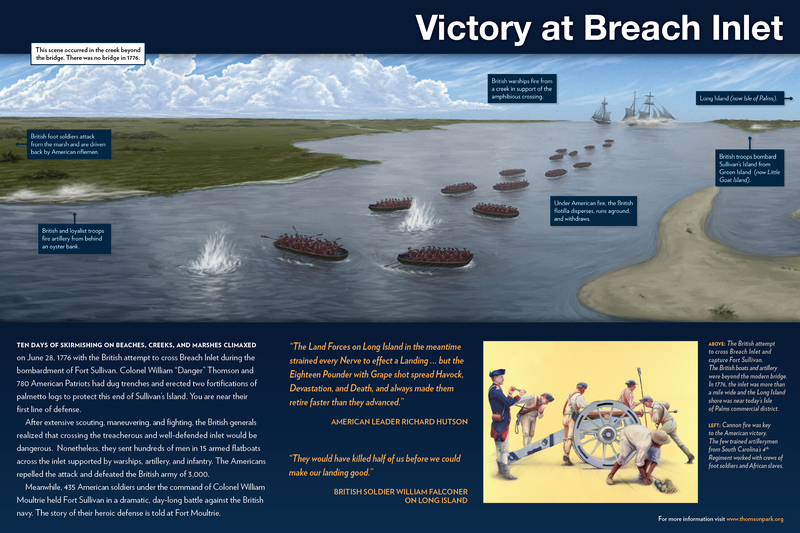 Major Samuel Wise from Cheraw District was in charge of 210 patriots at Breach Inlet when the British arrived offshore and began to land on Long Island. He is quoted on the right panel. Doug, they are wonderful and I am so happy and proud of what you have done. We were disappointed when Sullivan’s Island did not rename the new bridge to the Is. of P.as the “Thomson Bridge”. As children Momma always told the tale of drowned British soldiers and the heroism of Thomson and his Rangers.. I think it would be important to mention that the American victory at Sullivan’s Island was even BEFORE the signing of the Declaration of Independence. Doug, I have visited the park and am very happy with the results that came through much hard work and dedication – cheers and a big thank you. The park is nicely done! I can’t wait to see the new panel in place. Good work! I do recognize that building in the middle! Doug- I am extremely impressed with the articulation of the city print and all the explanations and artwork. You are a wonderful leader and I appreciate your dedication! In putting together the Marion Papers, I came across the following regarding the naming of Charleston. Charles Town was the original name for the settlement founded in 1670. The name was changed to Charlestown in 1729, I suppose at the time the colony switched from the proprietary government to English colony. The name changed to Charleston 13 Aug 1783. For the life of me I have not been able to find the source. Harvey Teal sent me impressions of various Post Office postmarks. In 1766 and 1767 the town was spelled as two words; however, it appears that the two examples were hand-written, not stamped Two 1780 circular postmarks (from a traditional stamp) from the British occupied town show two words ‘CHARLES’ on top and ‘TOWN’ the below. I’m not sure it can be unequivocably concluded that the latter stamps prove how the town was spelled, since to print the name as ‘Charlestown’ on one line would have necessitated a much larger stamp. It might be a good idea to sort out the presentation of the name. If I find anything, I’ll let you know. Please let me know if you find anything. I have been hoping someone else would comment on this interesting topic. We first addressed it while working on the three original exhibits. I don’t think there was a clear right way to spell the city’s name in the Revolutionary Era. You could make a case for any of several spellings. We settled on Charles Town for the exhibits because that spelling occurred frequently in primary accounts from 1776, and we’re sticking with it in the final exhibit for consistency. The spelling morphed from the original Charles Town(e) to the now-standard Charleston over more than a century. The Revolution years were a transitional time — I have seen it written every which way in accounts from the 1770s and 1780s. While Charles Town and Charlestown were most common in the period, Charles Towne still appeared occasionally and Charleston was already in use. Charlestown and Charleston seem to have become more prevalent as the war progressed. I suspect the official naming reflected the most common usage when the city was incorporated in 1783. The issue is complicated by the lack of standards and well-intentioned later authors “clarifying” the original text to make the reading easier for their audiences. I recall seeing some histories written in the 19th Century using Charleston without regard to the original language in quotations. Here are some of the various usages in the Revolutionary era: A London newspaper spelled it Charles Town in 1776 and a Charleston newspaper spelled it Charles-Town in 1777. (The dash also appeared frequently in South-Carolina.) The local almanac was an early adopter, spelling it Charleston in 1776. A quick check of some histories written by participants reveals that Ramsay (American doctor and politician) used Charleston in 1785; Stedman (British officer) used Charlestown in 1794; Moultrie (American officer and politician) and Drayton (American politician) used Charlestown in 1802 and 1821. 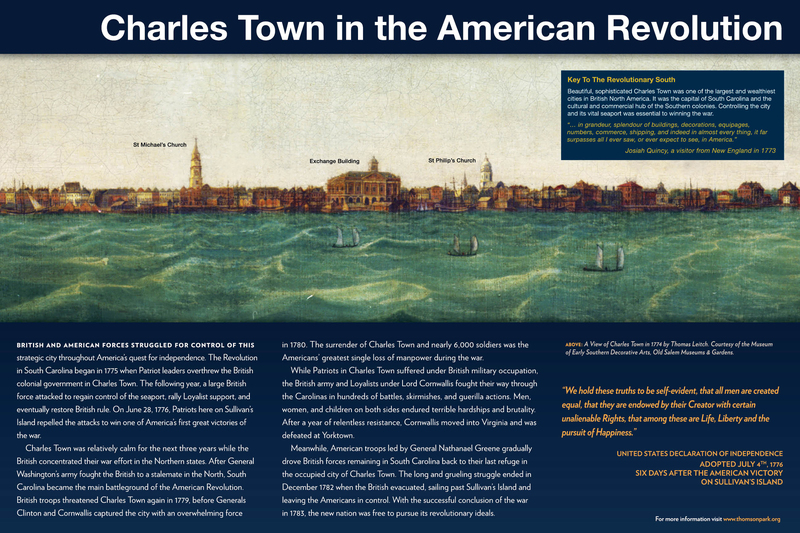 Maps from the 1770s and 1780s most commonly used Charlestown or Charles Town. Richard Hutson, who was in the patriot militia during the Battle of Sullivan’s Island, became the first intendant (mayor) of Charleston in 1783. He spelled it Charles Town in letters written during and after the battle of Sullivan’s Island in 1776.